Saturday March 10th Concert in Backyard Arts and Culture Centre, Moynehall, Cavan Town. Jig of Life Award 2018 Recipient Jackie Daly, button accordion and concertaina player, member of a number of prominent Irish traditional-music bands, including De Dannan, Patrick Street, Arcady, and Buttons and Bows. Claire Fennell Flute and Brid McGowan Flute, from Tyrone, we have Cathal Lynch Traditional Singer. Dublin's Kevin Meehan Whistle, Eamon Nugent Bodhran, Jack Warnock Guitar, Longford's Eamon McGivney fiddle. Antrim's Molly Walls Fiddle and Friends Seamus Fay Cavan Lilter. Galway's Neansaí Ní Choisdealbha Flute. Leitrim's Noel Sweeney Flute, Savannah Donohoe and Charlie Galloway UK, Flute and Guitar. NYAH now in its 15 year. The word "NYAH" refers to the very expression of the tradition.. to its lift or "soul". The NYAH Programme promotes events throughout the county on a year-round basis. 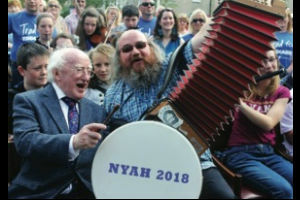 NYAH 2018 has received financial support under Festivals Investment Scheme from The Arts Council / An Chomhairle Ealaíon the national agency for funding, developing and promoting the arts in Ireland, Catriona O'Reilly - Cavan County Council Art Officer, Labhras Ó Murchú, Comhaltas HQ Seisiun Fund, Department of Culture, Heritage and the Gaeltacht, Shannon Side Northern Sound Radio, American Opticians, The Widows Bar Belturbet, Cavan One Hour Photo, Bridge St., Lynchprint, The Backyard Arts and Culture Centre Moynehall, Cavan.